LETHBRIDGE — Call it a moral victory. 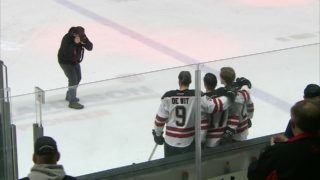 The Red Deer Rebels suffered their fifth defeat in a six-game stretch Sunday night, but GM/head coach Brent Sutter took plenty of positives out of a 5-4 Western Hockey League overtime loss to the Lethbridge Hurricanes. 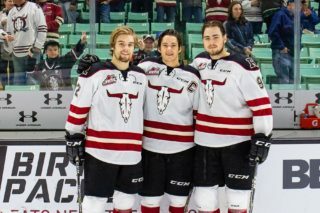 “Really, that was probably the best game we’ve played since the Kelowna game,” he said, reflecting back on a 7-0 win over the visiting Rockets on Nov. 16. 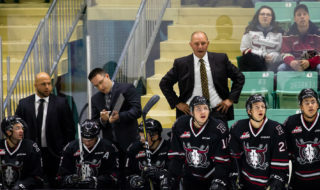 The Rebels went on to post a pair of narrow victories over the Kootenay Ice, then hit a slippery patch in which they dropped four of five prior to Sunday’s contest. “I thought we were good in a lot of areas. Just a few details cost us some goals tonight,” said Sutter. 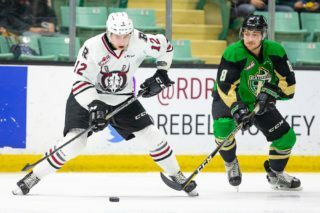 The Rebels trailed 2-0 after one period, but battled back with a second-period goal from Chris Douglas, who cashed a feed from newcomer Brett Davis, and an early third-period marker from Zak Smith, who got enough of a pass from Douglas to push the puck past Hurricanes netminder Carl Tetachuk. From there, Davis gave the Rebels their first lead of the evening with a short-handed tally at 11:35 of the third, creating a turnover just over the Lethbridge blueline, making a great move on a ‘Canes defender and slipping the puck past Tetachuk. “He’s a good player. That line with him, Smitty and Douglas was very good. They played well,” said Sutter. The lead didn’t last however, as Dylan Cozens drew the hosts even at 17:34 and Taylor Ross, with his third of the night just 69 seconds later, made it 4-3 for the Hurricanes. “You’re up 3-2 late in the game, you have to play the score the right way,” said Sutter. “On the tying goal, we turn the puck over inside the blueline, we don’t make a good read and it’s in our net. Then our guys were on the wrong side of the puck, in the wrong position, and it ends up in our net too. 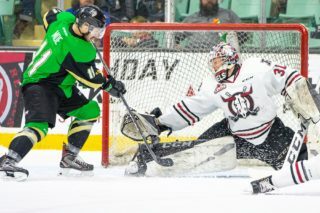 Davis, who along with Cam Hausinger — currently out with a minor injury — was acquired from the Kootenay Ice Friday, forced overtime when he converted a feed from Brandon Hagel with 18 seconds remaining in regulation time. But Hurricanes defenceman Nolan Jones broke into the low slot, hauled in a pass from Jordy Bellerive and beat Rebels netminder Ethan Anders through the pads at 1:50 of the three-on-three extra frame. Despite playing the ‘Canes straight up in terms of possession in the first period, the Rebels fell behind 2-0 as Ross scored on a redirect and later, from behind the net, banked the puck off the skate of Anders and in. “That second goal was a tough one to give up,” said Sutter. “But it was an even game here tonight. We did some good things, a lot of good things. We were really good here tonight considering it was our fifth game in six nights. Notable: Anders, who robbed Bellerive twice on the third period and once in overtime, finished with 36 saves, while Tetachuk made 28 . . . The three stars were (1) Ross, (2) Davis, who had an assist to go with his two goals, and (3) Cozens . . . .The Rebels, who with a 17-9-2-0 slate hold down first place in the Central Division — three points clear of Lethbridge and Edmonton — will host the Regina Pats and Swift Current Broncos next Friday and Saturday.